Those bands can be problematic. Each one is in essence, a mini storm front fully capable of spinning up a tornado/waterspout. The issue here in Florida is that these fast spin up tornados track in a completely different direction that one’s from normal storm fronts, so you have to keep track of any alerts from all directions. On the plus side, they don’t have time to become monsterous in size… but an up close EF1 will ruin your day just as well as the huge EF4s and 5s of Kansas / Oklahoma. Haven’t read it all, but the mention of the lowest point on earth reminded me of a fun fact. You are closer to the center of the planet when you are standing on the South Pole 2,835 m above sea level, than you are when you are at the bottom of the Challenger Deep. Maybe the reason Hawaii hasn’t fractured the plate is because it is right in the middle of it, and so it would have to tear the entire plate in half to break it. The hawaii hotspot is probably the most powerful mantle plume on earth right now, and from the looks of things, about 80 million years ago there were large islands like now and this is when you theorized it could have broken the plates. Currently the feed of magma to the big island is exceptionally high compared to the long term average, and may have started really increasing some point in the last 2 million years but especially since mauna loa and kilauea have formed about 800,000 years ago, which is why about 0.2 km3 of magma feeds into the volcanoes every year (95% to kilauea currently). This is similar to the situation 80 million years ago except without any plate boundaries. If it was closer to a plate boundary then it would likely have fractured the plate like you said, or formed a temperate version of Iceland. So the Hawaiian Hotspot 85 Million years ago, may have been a “Iceland’? Very Cool! Now, the other question I have… is the Hotspot still moving? Will it make it to land at some point? Or is it pretty stable, right there, there in the middle of the Pacific? and futher… i realize i see the land as stable and the ocean as filling in the low spots… probably comes from experiencing the huge tides we have here in Alaska… 30 feet and more sometimes. i see water as the breath of the earth…. it flows in and out, the land remains. The dominant driver of plate motion is subduction. (Slab pull). Whether the Hawaii hotspot makes landfall depends on the relative motion imparted by the various subduction zones. Nothing to support this, but the hotspot that carved the snake river plain is essentially what that would look like if it happened… but there is some evidence that it directly formed under the Eastern Washington/Oregon area. I read somewhere years ago that the Rockies’ basement is what blocked/slowed the remnants of the Farralon and that the melting of those remnants in one place is what is powering the hotspot. It also is supposed to explain why Yellowstone has not moved much in the last 3Myrs (relative to its previous 10Myrs). …Or something like that; I may be remembering it wrong. Another Stellar article addressing one of the more difficult topics to relate in plate tectonics. I particularly like the hotspot formation scenario presented here. It makes a sound alternative to the antipodal hotspot idea. I always had an issue with the high number of impacts that idea needed to account for the hotspots. 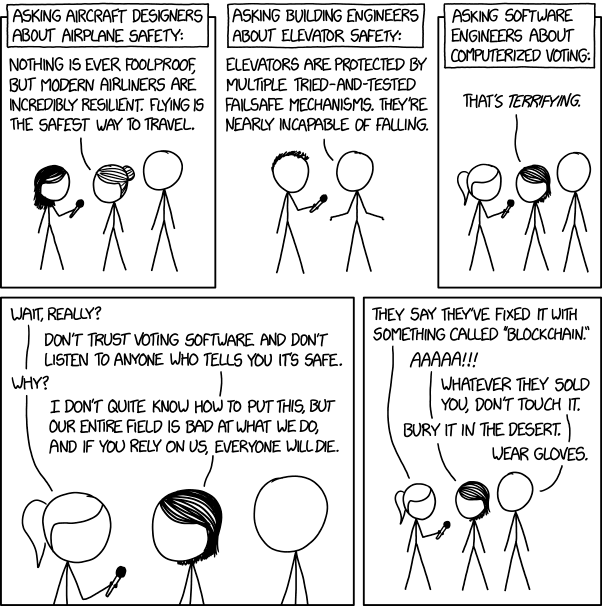 Looks like an xkcd graphic. Those are awsome! ca 2000m – at this depth if you shoot a hole in a pressurised scuba tank, water will rush in rather than air rush out! Outstanding! Makes you realise what an incredibly small slice of the Earths biosphere is suitable for human life. Here’s USGS photos of side by side of lava flow thermal data. Photos from Dane DuPont’s post. Also Dane Dupont on Hawaii Tracker, posted NASA photos of the Mauna Loa fire is getting bigger. Hopefully, it won’t be just winds, but rain to help put it out. I don’t know… It’s the Pacific so it gets weird. Around here, the weather after a tropical system passes is flipping beautiful nearly every time. Drier, clear, and aside from debris dust, and odd bugs from God knows where, absolutely fresh and clean. And occasionally, you get strange plants/weeds growing in your yard afterwards. The restart of the Mauna Loa inflation has become nicely visible. It began mid July, about when Kilauea resumed its deflation. Which may or may not be related! Its probably a direct cause, that scale is in changes of a few mm, so not much. But, a trend is a trend, and that one seems to be indicative of a real signal even through the noise. That link goes to an article about the June 27 flow, and it looks like the website hasn’t been updated since then. On mauna loa though, I have a theory that in Hawaii the volcano that is fed magma at a low rate (currently mauna loa) is subject to deformation caused by its more active neighbor. This can be seen where mauna loa had a small eruption in 1975 during a time when kilauea had a major (although short lived) draining associated with that years earthquake, and then several years later as kilauea was rapidly becoming more active there was the start of an eruption on mauna loa that was much bigger. Likewise in 1868 and a few points in the late 19th century kilauea became much more active than usual it was often associated with activity at mauna loa, which was dominant of the hotspot during that time. The amount of magma mauna loa has accumulated since 1984 is comparable to the amount of lava erupted during the recent eruption in puna, so it probably can’t hold off much longer and a rapid inflation of kilauea could push it beyond that point. Very rapid and vigorous rebound after deep collapses is a notable but poorly recorded characteristic of kilauea, it happened in the 1500s, in 1790, 1823, and on a smaller scale it happened in 1960 too. So things could get very interesting in Hawaii over the next few years, and in both volcanoes putting it off for longer makes it progressively worse in the end… I guess this is what happens when things don’t change for 30 years then have to make up for it all at once. Albert, that is such a huge and exceptionally educational article. I am amazed you can write and know so much! I have read only the first part, but now I understand the tectonics you explained so clearly. You are so gifted at explaining things! I’m jealous. Thank you for your generosity, both in time and ability to inform! The cool bit about it is that I think this may tie into a future article he’s been kicking around in the back channel. It might take a while though, a lot of rumination is going into it. I’m trying to argue a connection, but may fail if the evidence doesn’t support it. Albert makes the final call about that since I will blissfully ponder along on little evidence. VC deserves higher standards than some random wild arsed idea that I come up with. 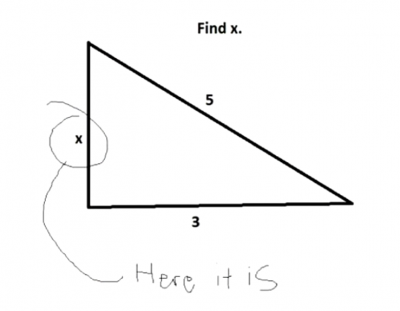 Nice trick; x = 4 but the upper vertex is far away than the base and the observer is aligned with the vertical side. and so, this one seems to be shorter than the base. It’s certainly not 4, as the line on the bottom is obviously more than 3 and it isn’t a right angle since the line at the bottom isn’t square with the line on the left. Sounds intriguing. How are the back channel ruminations going? Willie Nelsons annual concerts used to be know as the West Texas brain fry”. I think thats what we have going on right now. I’ve got at least two separate arguments going on there, each one is in opposition to the other, and Albert is the referee. I’m still tweaking my own crazy theory too. At least the main parts of mine, so far (needs much more analysis), seem to be pointing generally the same direction. The cool bit about it all is that no matter how ding-bat my ideas are, they will get looked at for their own merit and deservedly tossed on the trash heap if they are too weird. In 1886 Mount Tarawera went nuts. The popular Pink and White terraces along the shore of Lake Rotomahana were destroyed. 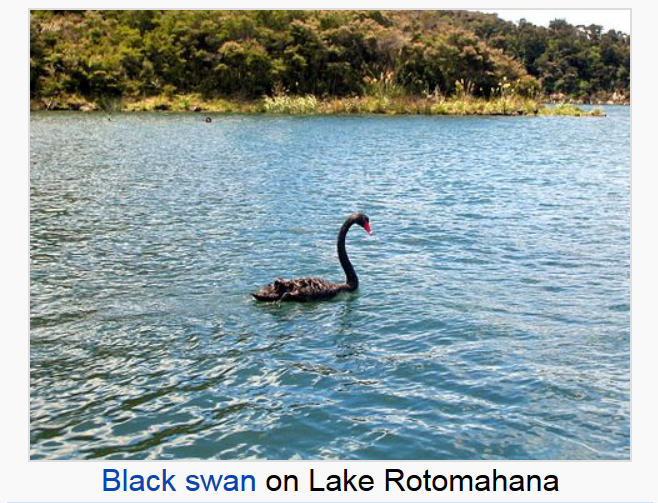 Though it was years before the concept of statistical black swans… take a look at something that Lake Rotomahana is famous for. Notice the arsenic part of that. Arsenic facilitates the dissolving of gold and enables deposition of gold by hydro-thermal fluids. Yet another example of mineralization. They cancelled Tropical Storm Warning for Hawaii. I’m concerned about the winds with no rain during these wild fires. Both Hawaii & California too, really need it to help put out those fires. Brian Hughes, a fireman from Hilo, Hawaii, went to California recently to help in fighting the wildfires. He died recently while battling the fire when a tree fell on him. Trees are vicious… especially when spooked or under duress. Condolences to the family. Fire damaged trees are really scary. They fall silently without warning and they are highly unpredictable. They also remain a hazard long after the fires have been put out. Respect to all the men and women fighting these fires. Big aftershock in Lombok: M6.2. I haven’t seen any reports about damages. The RIMS seismograph has suddenly gone completely quiet again, after a few minor eartquakes. It looks like a lot of them went quiet around the same time. Great piece, Albert. Definitely for me, the more I learn the more I realize how little I know. There is still a lot of lava flowing into the ocean, considering the eruption has essentially stopped for 3 days now. Also apparently pu’u 8 is glowing more than before, though there were no pictures. Considering the vent still has a lava pond in it after a few days it is quite possible there will be a few fountaining episodes in the future, although if it is like 1980s pu’u o’o these could be weeks apart. I dont think it will be a slow outflow like the 61g flow before, its probably too far from the summit for that so it might just build pressure until it can suddenly push up through the vent, or possibly through uprift fissures or even pu’u o’o again (although that is less likely). This would be very destructive as these lava flows will cover new areas due to the old channel being blocked, and this includes to the south over the ridge, as well as parts further north. It will be interesting how this plays out. He probably was, it was a glancing blow and bears are pretty tough. I’m thinking the only real hazard (to the bear) would have been a broken neck due to the tangential force imparted by the vehicle. If it survived that, it likely shook it off and sprinted into the brush. In your case, not stopping was probably the safest move. A stunned bear is not to be trifled with, even if it was just a black bear. Though they have a less dire reputation than a brown bear, they are still quite capable of doing massive damage/injury. Dunno for sure, but I think the black bear won’t chase you as far. Grizzly (Brown bear) don’t give up as easily. I do know that ursids are close cousins of canids, and I’ve seen dogs survive some amazing stuff. You would not be that far off the mark to think of a bear as being a ruggidized dog chassis. A dog is optimized for long distance pursuit… a bear is optimized to slug it out. Which is interesting. When in shape, a human fits the bill as a pursuit predator like a dog. While we can’t sprint for miles, we can trot along for great distances, wearing out what we are chasing. This similar mode of hunting is probably one of the reasons that dogs came in handy when they became domesticated. I’ve even seen some arguments that we didn’t domesticate dogs, they taught us how to manage herds and become pastoralists. The fact that humans and dogs have strong familial social interaction traits made us compatible under the right circumstances. Ok, stupid bear joke. If you’re being chased by a bear, how can you tell if it’s a black bear or a grizzly? Climb the nearest tree you can get to. If it climbs up after you, it’s a black bear. If it knocks the tree over, it’s a grizzly. Tyler Mannison Plume coming out of Pu’u O’o. Well, maybe. Could have been a rock-fall. But from the photos, it seems a bit more persistent than a dust cloud. Yellowstone is basically the equivalent of that person who did something epic once and lives off it forever, while never actually doing it again… In the past 3 days kilauea has erupted more lava than Yellowstone has in the last 50,000 years… Effusive volcanoes leave their explosive counterparts in their own dust. Daily fail need to find something else to scare everyone with. I have no idea how much lava has been erupted in Iceland in the last million years but it could be somewhere close to 1 million km3 which is bona fide flood basalt territory. Yellowstone is basically just a normal volcano that has decided to erupt all of its volume in one go instead of slowly over time to build a mountain. Yellowstone would definitely be a massively large geologic “hold my beer” event, however, most of it’s eruption would be made up of heavy stuff that would settle out fairly quickly. The immediate area would obviously be pretty busted up for a while, but the earth, as a whole, seems quite adept at sorting out large but short-term bumps like Yellowstone relatively quickly and getting back to normal programming. I agree. Kilauea and Hawaii volcanoes in general are and have been in an entirely different league over the past million years or so. A league unto itself… Impressive at one time, not so much anymore. Yeah, we all run across a guy like this. Highly skilled star athlete. Back when he was 17. The bit that seemed strange is that the calculation to get an eruption due date right now always included the eruption 1.3 million years ago which was not a VEI 8. It was very big but several Holocene volcanoes have been in that size range so it’s not an unusual event really. The last eruption was a VEI 8 but the one before that wasn’t until over 2 million years ago and could be classified as a different volcano. Even if it isn’t, 3000 km3 is not really exceptional for any volcano over that sort of timescale, most average stratovolcanoes could probably get that big easily if they stay active that long. Then you have Hawaii where 10,000+ km3 in <0.5 million years is a bare minimum requirement… Even the smallest Hawaiian volcano (mahukona north of the big island, likely never made it above sea level) is way bigger than yellowstone. Todays update by Philip Ong. Around 1/3 of the way through there is some interesting discussion on possibilities of the rift deflating and collapsing over time. I dont know exactly if this is the same thing as the recent discussions on pit craters forming but it sounds similar. Katla is very very slightly stirring. No signs of unusual activity beyond the typical summer uptick. Doubt it will cause drama this year unlike the last two! In legend, she was not to be trifled with, the volcano has about the same personality. BTW, I think that Katla got a bad PR wrap about her anger. The rough time period was after 1169 AD, ticks and lice were probably a real threat. Her “magic breeches” were obviously pretty special and likely hard to replace. Bardi, a laborer who worked with the sheep, probably had a high exposure rate to parasites. His wearing of her clothing likely increased the chance of passing on any parasites to the apparel, no matter what his excuse was. (rounding up the sheep). Can you really blame her for getting mad? But hiding Bardis remains in the meat storage of the farm (at that time stored submerged in a large container with sour milk), has to be considered as an evil act. It took several months of meat consumtion into the winter before Bardis body was identified among the meat chunks. Thanks Albert for excellent review Post. Thanks to your entertaining and informative posts we continue to develop our understanding of our planet! Also a lot of questions follows, just like science should be. Baltic sea is not a sea anymore. It is a bowel of vegetable soup! 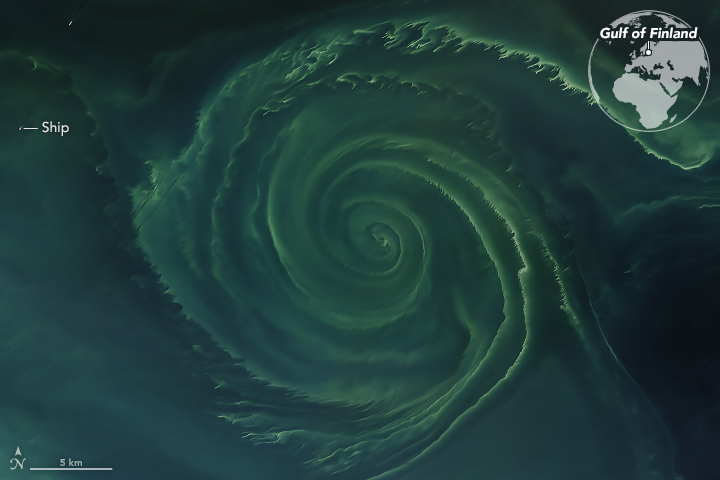 A spiral galaxy of plankton. Kind of has one wondering whether similar forces are at play. Using satellite images of Lombok from the days following the August 5 earthquake, scientists say the island has been lifted by as much as 25cm. Scientists say the powerful Indonesian earthquake that killed more than 300 people lifted the island it struck by as much as 25 centimetres. In the northwest of the island near the epicentre the ground lifted 25cm. In other places it dropped by 5-15cm.. The death toll from the quake has now climbed to 387, with over 13,000 injured. Not unlikely over the missions lifetime. But the Delta IV Heavy lifting platform is well tested. What I find interesting is that “Carbon-Carbon” heat shield. The polymers in the carbon fiber components are vaporized out and replaced with carbon from a carbon rich gas such as acetylene that re-grows the binding substrate back out of pure carbon. “Carbon–carbon materials retain their properties above 2000 °C” so it should be able to withstand the environment it is due to operate in. As long as everything works as designed. Live coverage starts in 37 min. Weather seems to be cooperating. BTW…”Not unlikely over the missions lifetime” also refers to the culmination of the mission. Per the broadcast, once the maneuvering and station keeping fuel is expended, the craft will eventually start to tumble in it’s orbit due to gravitational influences. Once that starts, the craft will begin to erode into a dust. So yes, eventually it will fail. (by design) But due to its location, it’s highly improbable anyone is ever gonna run over it. Good launch. Second stage restart just went according to plan. Passing over Africa right now. Perfect launch. The Delta is reliable (but also very expensive). Now we have to wait 6 weeks when it flies past Venus. The first of 7 flybys of Venus, all for gravitational assists. Getting to the Sun is hard. Yeppers. And one of the reasons they picked such a large lifting vehicle. 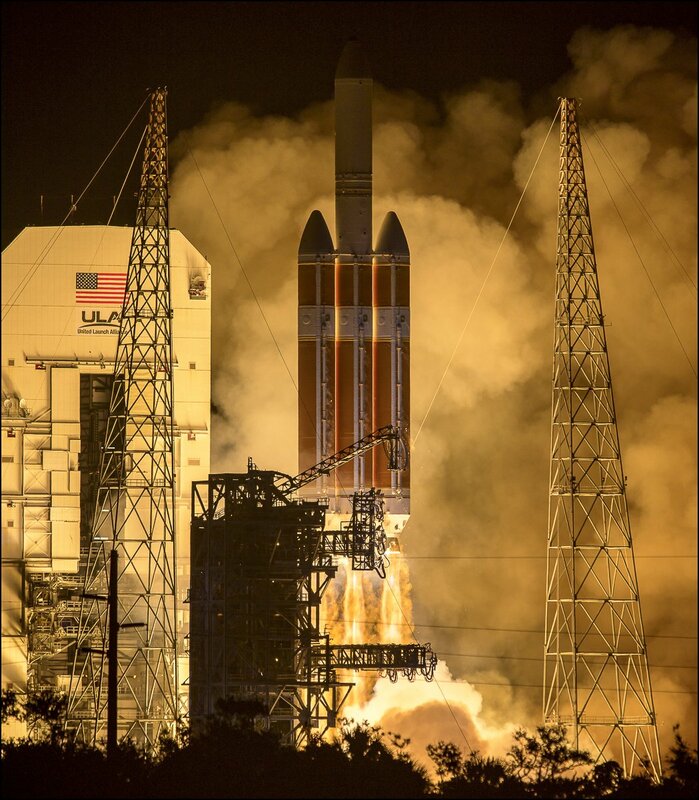 With the probe being at about 10% of the Delta’s lift capability, it was used to get a really high start speed. Anyone else not getting emails for new comments? Well they technically found something else to worry about… I’ll give some credit in that this one could be rather a lot worse and is maybe a lot more likely to actually happen compared to yellowstone, but it’s still pretty remote. Interesting to learn that long valley is still very much alive though, I thought it was dead and the magma source was feeding eruptions towards mono craters and mammoth mountain (both technically separate volcanoes). I read something that said eruptions within the next 100 years in this area is not actually unlikely, it is likely to be effusive with either very fluid basaltic lava or rhyolitic obsidian flows (VEI 5 tephra at most) but it will change the landscape a lot and eruptive episodes can include dozens of eruptions and possibly last for many years, it is a very interesting area. Its pretty much the only place in the US where an entire mountain can just form in real time. Got to love the local news twit. BTW, Karenia brevis is the dinoflagellate most responsible for the condition. It is endemic to all Gulf Coast waters and produces a neurotoxin. Red tide toxins has blown in as far as 15 miles south of Tampa is were I live. I had to go out yesterday morning and when I got home I had a bad head ache and I was no where near the coast. I have been here 20 plus years and I have never been effected before. This morning my friend who lives 5 miles closer to the coast called me to tell me that it smells like dead fish and her eyes was burning. She is 10 miles inland. The wind was coming in from the west because of the rain blowing in. Today she was very horse when she talked. Before I moved here I lived in Gulf Breeze so I enjoy your stories. Two winters ago, CSX dropped three tank cars of Phosphoric Acid off the tracks north of here near McDavid. I was worried for a bit, but evidently the Hazmat crew did a good job of remediation. I was expecting Escambia bay to be trashed with a karenia brevis bloom. Those tanks were probably for Air Products. I worked in the quality assurance lab there for a while. The mess that big sugar has caused around Lake O is turning out to be a big political issue down here as well as red tide bloom, The lake was lowered for hurricane season and that thick pea green soup of nitrogen and phosphates worked it’s way through the everglades. There are still canals that drain to the east and west coast from the everglades. The Army Corps of Engr. has removed some of the canals to correct some of this. Karenia brevis still has plenty of yummy food to feast on to trash the coasts and kill marine life. I’ve been looking at the situation on kilauea, I think it is getting pretty safe to say the eruption is over. There is no sign of inflation around the vents that would indicate a reactivation at any point, and the magma in the dike is probably just going to cool down. The base rate supply (4-10 m3/s) of magma is most likely not high enough to keep such a long dike open indifinitely, especially considering that sort of eruption has never occurred in lower puna below heiheiahulu but another shield formed almost exactly where heiheiahulu is now in around 1500 (probably just after aila’au stopped). This might be about the limit to how far dikes can stay open at the base rate supply. It also could be that no pit craters have formed in the upper rift now because of differences in the locations of long term eruptive centres. In the late 1700s heiheiahulu was active and that was rather lower down the rift than pu’u o’o. The 1790 eruption basically occurred directly downrift from the sustained vent. This means that there could have been more of a significant draining in the upper rift. As mentioned above, around 1500 there was also another shield that was in a similar place to heiheiahulu and has been partly buried by it, and thus there was a very similar situation then too. In contrast pu’u o’o was more uprift and so maybe more of the magma storage was under pu’u o’o itself than further uprift. Heiheiahulu doesn’t have a really big deep crater like pu’u o’o, and evidently the 1500 shield didn’t either because it was buried, because the 1790 and 1500 (490 BP) eruptions weren’t really at a significantly lower elevation than those shields (100 meters?) compared to the 400 meters difference between the floor of pu’u o’o in April and pu’u 8. The bottom of pu’u o’os crater could well be not far off 400 meters deep actually, the crater will probably get significantly bigger in the next few years. Both of those earlier eruptions in ~1500 and 1790 seem to have created pit craters in the upper rift (makaopuhi and maybe napau in 1500, all the other ones in 1790) while this seems to have done it on pu’u o’o instead, with the common factor being location of the long term rift eruption before the major drainage event. The summit affects have been roughly equivalent in all 3 (possibly bigger in 1500 but not by a lot) so I don’t think having no pit craters form is really the biggest factor in what kilauea does next, I think it is actually the location of the long term eruption preceding the caldera forming eruption that is actually dependent on what happens on the rift regarding pit crater formation. In any case the deep feeder was not damaged by the recent events so the rate of supply should be the same as before. Nowhere is inflating probably because everywhere still has to adjust to the new collapse. In the next few months there will probably be a noticeable long term inflation on the graphs. I agree: I see no evidence at all for activity or magma transport at either Kilauea or the east rift. The cooling itself can cause instabilities and that could give minor explosions but I would not expect a resumption of the eruption. That means it ended in the best possible way, suddenly without new areas being threatened. Here is a visual idea of what I am talking about. This is possibly what kilauea’s east rift looked like in 1790, with probable magma storage areas in the upper east rift being emptied during the draining, and the dike starting from heiheiahulu (H) which is already close to the Leilani (L) estates area. The key point being that much of the east rift magma storage is in the upper east rift while comparatively little is under the heiheiahulu area. This scenario is probably similar in 1500 when the first caldera formed and a lava shield formed in the same area as heiheiahulu, the eruption scenarios then were very similar. This in contrast is probably what the east rift looked like before this year. The key point is that most of the storage area is below pu’u o’o, and not the upper east rift. This leads to pu’u o’o being the main point of collapse during this event, and it is possible that smaller pits will form on the complex in the future as they reach the surface. Pu’u o’o crater was about 300 meters wide in 2011 and the crater is currently deeper than it is wide so the bottom is probably not actually far off the elevation of the eruption in Leilani estates, and probably close to 400 meters deep from the edge (and 300 meters below the 1983 ground surface). Assuming the pits usually end up about 50% wider than they are deep it is likely that pu’u o’o crater will get a lot bigger in the future as the edges collapse into the deep part during earthquakes etc, it is already as big as several of the chain of craters right now. This might also have something to do with why this eruption seems to have been somewhat bigger than the 1790 eruption, there was probably more available magma. A major quake occurred on Alaska’s North Slope. It was on shore and not quite big enough for a tsunami, M6.4, but it made me wonder how a tsunami would interact with sea ice and the polar cap. I wonder if the ice pack would act like a scale model of Albert’s bulging hot spots? Very unexpected location for such a big quake. It is in the Sadlerochit mountains, and there is a thrust fault there so I assume that was the fault that gave way. It is called the Weller fault and you can see it on the image (top left) as the line between the light coloured and darker coloured rock. The deflation at Kilauea has completely stopped, as seen in the UWEV-CRIM length. And the same has happened at Pu’u’O’o, as shown in the daily plot. It had deflated linearly, meaning magma was leaving at a constant rate from a single magma chamber. At Kilauea, the deflation was step-wise, presumably as different magma chambers were being accessed. Today’s earthquakes were dominated by very deep ones, 30 kilometer or more. Very deep means it has a significant recharge on the way, like I have been saying. Using something I saw a few years ago on one of Carl’s Iceland posts, it was said that if you ever get an earthquake ‘swarm’ (here meaning more than 10 earthquakes in a week rather than a real swarm) in the dead zone then all you have to do is wait because a major rift event has started and one of those legendary flood basalt eruptions is on the way. Kilauea obviously doesn’t erupt on quite that sort of scale but it’s interior would be far hotter and more plastic than the crust of the south Iceland seismic zone, especially now considering its continuous eruption since 1986, so quakes at depth under kilauea should be seen with some measure of concern also. There were some very deep quakes towards the north of kilauea in the 1955-1959 period that are believed to be the warning of gas rich and very primitive magma that erupted in 1959, so something like that now with a deep caldera that, according to a post by USGSVolcanoes on Facebook, has very likely sunken below the water table is definitely a massive potential hazard, in fact they have been issuing warnings for this exact event for years, that kilauea could one day return to a dominantly violent mode of eruption. The 1959 eruption was big enough to be a small VEI 4 if it erupted as ash in a phreatomagmatic eruption so frequent repeated eruptions on this sort of scale up to really a lot bigger can give some context to how powerful kilauea actually is, in its current state only grimsvotn and maybe the klyuchevskaya group are any sort of competitors. Starting in 1790 all the way up to around 1815, between 9 and possibly as many as 15 eruptions at least as big as 1959 happened, several were probably significantly more powerful with lava fountains likely exceeding 1 km high above the vents. 1790 was the biggest (probably at least 0.2 km3 total) but there are a lot of tephra layers of comparable size afterwards, and the depth of the inner ledge described in 1823 indicates that eruptions were also nearly continuous at a low level between these high fountaining episodes, rather like on mt etna in recent decades but with far higher eruption rates. The deep quakes seem to fall into two groups. One is at Pahala and probably is magma movement. The others are distributed and are probably settlement of the island. Pahala is definitely magma, but I wouldn’t rule out some of the other ones being magma too, as I said before there was magma fed from the north in 1959, so not all of kilaueas magma comes from further southwest. In 1924 the main source even seems to have come from the east, as very deep set deflation occurred that year that was detectable in lower puna with 1924 technology. That is also why I think 1924 is a very poor comparison to the current event, which has been visibly far larger in every aspect (including having at least one bigger explosion- so much for ‘the big one’ the news was preaching about in May) but in the current event there has been no deep source deflation and it has occurred during very high magma supply as opposed to very low like in 1924. I think that the caldera collapse at Bárdarbunga is a much better comparison to the recent Kilauea events. Looking back now it does not appear that there was ever much (if any) new supply associated with this event. To me, from the USGS analysis of the quake, plus the GPS jumps, it appears that the 6.9 that kicked this off was probably just Kilauea sliding a bit off of Mauna Loa. When that happened it broke something in the Pu’u O’o plumbing and diverted the drain tube lower down the LERZ. If/when there is any new magma, it will find a very busted up caldera plumbing which might be interesting for sure. Would all depend on rate of any new supply. Plus, probably cannot just assume that the possible magma movement indicated buy the lower quakes is movement up. It just shows that something is moving somewhere up/down/sideways and equalizing some pressure along the way. Actually HVO have confirmed that the long term earthquake swarm to the southwest is the deep part of kilauea’s magma conduit. There is also no reason why it’s supply would have stopped, everything that has occurred during this event was within the upper 3 km of the crust, the deep feeder was unaffected by all this. In both previous caldera collapses there was vigorous activity immediately afterwards, not a slowdown as was previously believed, so the magma supply seems to be continuous during high supply rate periods. There are some similarities between bardarbunga 2014 and the current events on kilauea but not as many as you probably think. Bardarbunga was a far bigger event, the only time there was significant magma intrusion from the mantle was at the start, mainly just north of bardarbunga but possibly also directly into the dike although that is debatable. 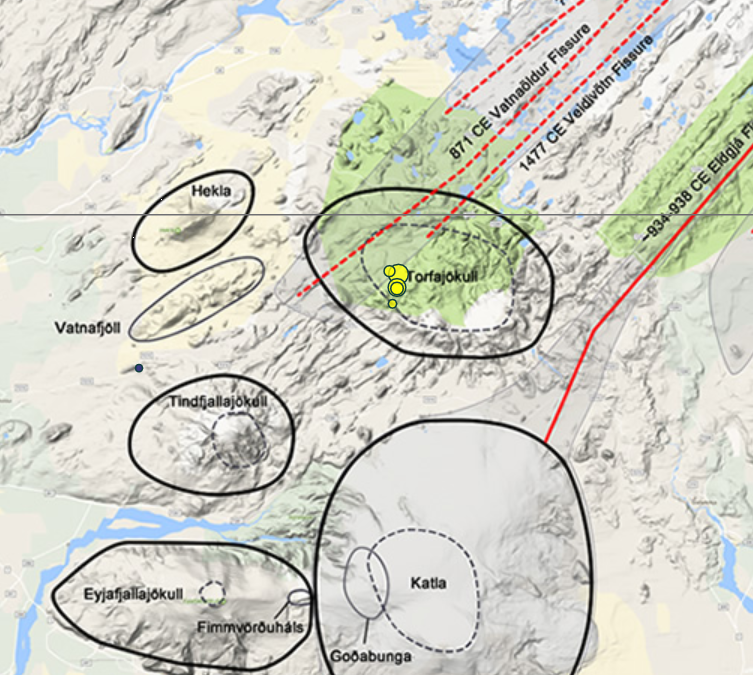 In total maybe 4 km3 of magma was involved with about 40% of that reaching the surface at holuhraun. The dike was also way deeper in the crust, probably around 10 km or even more, as opposed to 3 km at kilauea. Bardarbunga also wasn’t continuously erupting for decades before. At kilauea, there is the rather notable case where this eruption is almost exactly the volume of the new caldera. Both are close to 0.7 km3. This might appear to be direct evidence of connection, but this is actually not an intuitive thing. The caldera is going to be the volume of all of the magma that has left the summit, but to have a distant eruption you need a long dike and that requires significant magma too. In reality most collapses caused by effusive eruptions are about twice the volume of their eruption, with a good example being kilaueas 1840 eruption, a collapse of 0.4 km3 and an eruption of 0.21 km3. Holuhraun fits nicely into this. The one case I have found where this is also broken just so happens to be the previous time kilauea did something like this, in 1790. That years east rift eruptions covered about 40 km2 of the rift zone stretching from the 1977 eruption all the way to cape kumukahi, and the southern rift being in almost exactly the same spot as the current eruption. Even assuming the flows were only 10 meters thick the eruption is already 0.4 km3 (way bigger than USGS estimates) and particularly the southern rift probably was similar to the first main stage of the current eruption just before fissure 8 reactivated, that was as high as 0.2 km3 in only 2 weeks, and the southern 1790 rift was twice as big as that in area. The 1790 collapse was maybe slightly bigger than the current one, about 0.8 km3, but in both cases the eruptions were much bigger than 50% of the caldera, closer to 90%. Assuming it takes about 0.2 km3 to even get to the lower puna area, then that would mean both eruptions require more magma than the size of their calderas, there is only one thing that can mean. A good comparison between the current events and holuhraun can be made, but that is probably because both events are very recent and very well observed. It would, however, make a lot more sense to compare the recent eruption on kilauea to another very similar eruption on kilauea, and there are a lot more similarities doing that. One other thing I should mention, the volume I used isn’t final, it’s based off what you get from ~8.5 million m3 every day for the duration of the main eruption. However, HVO has said they probably underestimated the volume somewhat because the channel is deeper than they thought it was, so any number coming from detailed analysis is probably going to be an increase if anything. I have seen a number of 15 million m3/ day used, and that could well be within the bounds now. If you look back too, the 6.9 quake was also caused by the eruption, not the other way around, the first few fissures opened before the quake. It was the increase in pressure (likely caused by a pulse of new magma as well as pu’u o’o preparing for a new breakout) that caused a new intrusion into the LERZ and after two days it was too much and forced the south flank out of the way. It is notable the summit didn’t start responding until after the quake, when previously the connection to pu’u o’o was within hours. At that depth, it is not easy for magma to move sideways. The pressure is so high that no empty spaces can exist. Vertical fractures are easier to travel through. 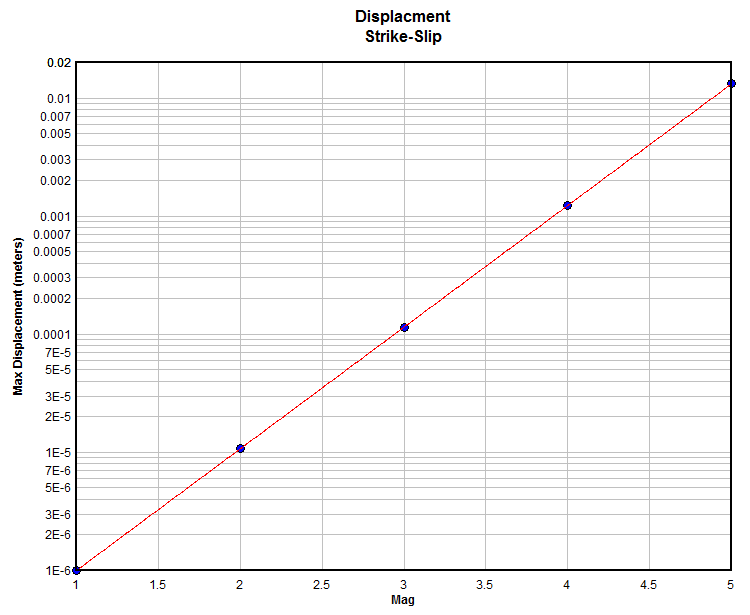 Most magma movement at that depth is likely to include some vertical motion. The current eruption was preceded by years of activity at Pahala, It is not known (yet) how much of the rising of Overlook was due to a new magma pulse and how much due to reduced transport to Pu’u’O’o. My guess is that both have contributed. The summit reservoir was responsible for the Leilani eruption. It provided all the pressure, and in later phases also the lava itself. Some magma must have been used to fill the space created by the M7 quake but that was a small fraction of the total. The magma underneath Pu’u’O’o seems to have disappeared.. We have to wait for the detailed accounts to see where that ended up. Part may still be below Pu’u’O’o. It was not on the magma path but bled into the dike. The problems at Pu’u’O’o came before the M7 quake, and that quake was probably triggered by the excess pressure. But it must have been ready to fail already. That quake allowed the dike to Leilani to form. Without that quake, we would have had a very different eruption. 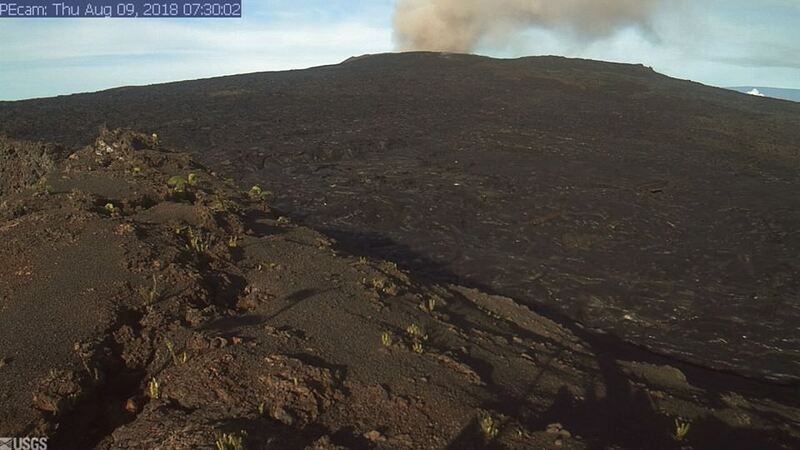 I would expect a bit of rebound on the summit and Pu’u’O’o in the next weeks, as the dike closes. Albert, the dike to Leilani formed before the M7. The first fissures had already started to erupt before the M7 happened. I think the comparison to Bárdarbunga is interesting. I looked at the moment tensor solutions for both collapse sequences and they look very similar. Non double couple quakes with the same polarity and of similar size in both cases. You are right; Leilani first erupted on May 3 and the big quake happened on May 4. It seems years ago.. The summit collapse mechanism is identical to Bardarbunga. The only real differences are the fraction of the magma that made it to the surface, and the fact the the Kilauea summit collapsed as a larger block than Bardarbunga, which gave the series of large quakes. Perhaps the rock in Bardarbunga was much wetter with less cohesive strength. The eruption rate was fairly similar (Bardarbunga erupted more but over a longer period of time). The elevation difference between the summit and point of eruption was within a factor of 2, which may be why the eruption rate was similar. The end is also the same: a sudden cessation, with the eruption and the collapse ending near simultaneous. I see that more clearly now. I had the timing off. Looking back at the patterns from early May, it seems more obvious that the slip fault was probably already slipping a bit before the 6.9 on 5/4. And, clearly something had already at least partially broken because the new LERZ path to Leilani had already formed by 5/3. The new energy travelling down to Leilani crossing the path of most of the Pu’u O’o flows the must have encouraged the fault to slip a bit more aggressively which then more radically altered the plumbing. Did you feel the big quake yesterday? It was quite far away, I expect. Could just be my imagination, but is there a persistent IR signature more or less right over the AK quake area? On-shore wind and these are the only mountains close to the coast in that area. So it is likely ridge cloud. Probably right but, I saw it and it looked a little odd in that it persists over at least the 8 hour period of this loop, so I wanted to get it out there for someone else to look at too. It appears that he weather has cleared a bit over the Alaska eq swarm area and these IR loops (with various filters) still look odd. Anyone else see something weird too or is it just my eyes? 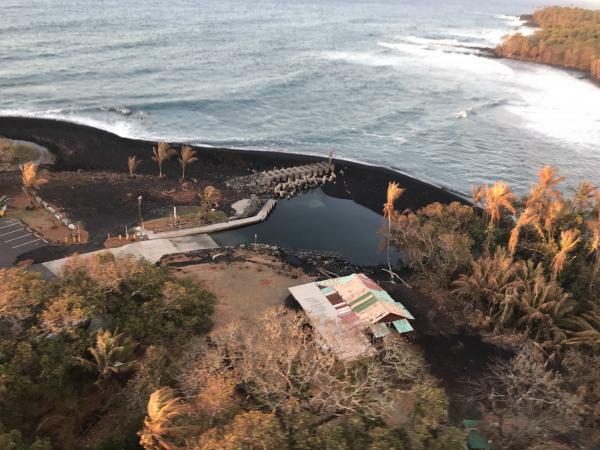 The Poihiki boat ramp has survived and seems saved. But it is not very useful anymore except as a walk way to get on the new black sand beach. At least the bay is still there so building a new one should be possible. I think they have gained a new *warm* pond for their loss right ? Yes. But do they really need a jetty for a small pond? Seeing all of this new black sand and the weeks and weeks of dirty plumes stretching for miles in the water at the ocean entry has sparked another question. How much of the mass of the lava here in Hawaii is washed away or blown up into the plume when it enters the ocean compared to how much sticks together enough as new rock to build up the seabed and ultimately form a bigger base to add to the island? Most of it stays attached, only the dusty stuff gets washed away initially. If most of it was washed away then I dont think the island would exist. But how much makes up the “most” that stays attached one it hits the ocean vs.how much is washed or blown away? Is it 1%, 2%, 5%,10%, 20%….more? I have no idea. Where I am going with this is I wonder how much additional mass from erupted magma has occurred in Hawaii over the past million years or so that drifted away in the steam or water plumes or that was pulverized into sand and is not represented in the current land masses. I dont think there is really a way to find that, it depends on the currents at the time and which side of the island the lava flows into. This eruption happened on a point and near the ocean facing into the current, so it might erode more than a flow that occurred on the other side of the island like mauna loas 1959 flow. In general it is probably negligible when the volcanoes are in their shield stage like kilauea is now though, it might take decades or even centuries to erode the same amount of land as it would take only a few days to produce from a new big flow entering the sea like it is now (still going 2 weeks after the last surge). The current new land is very likely to be permanent except maybe the easternmost part which shows some faulting. The only thing that might take a significant piece out of a shield stage volcano is a mass sector collapse but kilauea is currently not old or steep enough to do that. Of the lava that gets directly in touch with sea water, very little survives. It fragments very effectively because of the rapid cooling and temperature gradients. You get the black sand beaches, and the lava islands are so loose that they erode rapidly. But a lot of lava is behind the front and that never touches the water. In consequence, a thin flow will self destruct but a thick flow will fill in the sea much more efficiently. In the Puna eruption, roughly 10% of the lava went into the sea. Most of that survived (I would guess 90% but that is only a guess), and the remainder caused the discoloured water and the black sand. Over the next few years, erosion will take quite a bit more especially near the surface where wave action is strongest. Much of the eroded material will slide down and build up the lower subsea slopes. And as the entire island sinks by a centimeter or two per year, what is now above water will eventually meet the sea as well. By which time new lava will have created anew surface above it. Overall, it is fairly easy to spot the parts of Hawaii that formed from subaerial flows. And, the current mass of the volcanoes and the Hawaii chain have been calculated. So, if even 10% of the mass from these eruptions diretly hit the ocean water and fragmented, then that means the erupted volume that created Hawaii was even bigger. Is that a fair statement? That is a bit too simple.. Everything on Hawaii that erupted before the island reached sea level was erupted below the sea. The original ocean bed was 5 km deep. More than half was erupted before subaerial became an option. Deep eruptions don’t fragment in the same way, because of the high pressure. And a lot of the sides came from the slow sliding of the mountain, as happened in the big earthquake. That is material that is originally solidified in air. So the contribution from the flows entering the sea is not that much. Actually most of the volcano is formed after it first reaches the surface. Kilauea is ~ 400,000 years old but only reached the surface about 60,000 years ago yet most of its mass is formed since then. The Hawaiian volcanoes start off weak and small erupting infrequently and with small volumes of alkali basalt, possibly forming initially just as a weak spot on the southern end of the deformation arch around the islands, which has been found to be the source of extensive submarine flood basalts too. Then as they get closer to the main plume they erupt tholeiite hotspot magma and start growing quicker as well as forming a magma chamber, loihi is in this stage, and kilauea recently left it. Eventually they end up on the top of the plume and become hyperactive, kilauea is entering this stage while mauna loa has just left it, this stage is basically continuous high activity like right now but it doesn’t have to share the hotspot, so the volcano grows very rapidly and becomes steeper. After that activity wanes but can linger on for up to several million years before dying off. This is the same idea is the generally known and published idea of Hawaiian volcano activity stages, except I think the shield stage should be divided into two, as the eruptive styles of kilauea and mauna loa are quite different despite both being shield stage volcanoes. The immense (60,000+ km3) volume the volcanoes reach seems to be a new thing though, aside from mauna loa only kilauea is comparable relative to its age (kilauea is still a young volcano that has yet to experience its strongest growth stage but it is already one of the biggest Hawaiian volcanoes by volume) so this is likely another indication the hotspot has increased markedly in recent times. Mauna loa has a volume of 85,000 km3, and is about 700,000 years old, but its growth wasnt constant. It was probably very slow in the beginning, taking many hundreds of millennia to reach sea level but rapidly increasing as it went over the crest of the hotspot. We will never know the real numbers, but by assuming it took its time like kilauea and only breached sea level 200,000 years ago (when it was about 500,000 years old like kilauea was when it breached sea level 50,000 years ago) and had similar proportions to kilauea until about 140,000 years ago (about 40,000 km3 volume), then it would have erupted 45,000 km3 of magma in 140,000 years, an average of about 0.32 km3 every year. At points this would have been significantly higher as its growth was not linear and it seems to have largely stopped growing since about 20,000 years ago, which would technically bring the average up even more to about 0.375 km3 every year. Overall it seems fair to put the average at 0.36 km3 per year. This is on par with the total feed to grimsvotn including passive rifting, and about 70% more than what kilauea is getting right now, eruptions as big as its 1950 eruption could have happened every 2 years or less, though likely a lot of this activity was passive effusion from summit centered lava lakes rather than rifting fissure eruptions. The speed with which it entirely filled in two mass avalanche scars (alika 1 and 2 slides) during that time period is telling to its far higher activity than today, if one of those happened now it would be largely permanent. This is what should be expected of kilauea within the near geological future, If history holds true then there will probably be a surge in eruption at some point in the next 10 years like what occurred after previous caldera collapses, that will give a taste of what this future activity could be like. I am personally very interested to see what happens. Not all the growth was from lava. Some was from bulging of the ocean floor, and some from magma that stayed below ground. Say half was from lava (mostly the top half..). The mountain is sliding down by 4 centimeters per year (recollection – number needs checking) which over the surface area of Mauna Loa (reported as 5000 km2) corresponds to 0.2 km3 per year. As the actual height remains constant, this tells you that the magma supply will be about the same. The sides under water are much steeper so there isn’t as much material there as the triangle suggests. Based on some additional data and side research (that unfortunately I am not remotely ready to share yet), I would not be surprised if the possible timing of the major building activity at Mauna Loa was even a bit more compressed starting at roughly around 110,000 to 120,000 years ago. That growth rate also pretty much confirms my other observation, that the hotspot now has a significantly higher rate than the long term average of the Hawaii-Emperor seamount chain, and that the increase is geologically very recent. The amount of magma that actually stays underground forever is not a large percent in Hawaii either, most of kilauea’s intrusions that don’t erupt will act as pathways for future ones to do so at some later date, pu’u o’o formed over an area where intrusions and small (but slowly increasing) eruptions had been occurring almost yearly since 1961. Only a few intrusions in historical time have actually gone unnoticed by initial later activity, 1924 on the east rift, 1974 and 2006 on the southwest rift, and even in those cases it is possible for that magma to still erupt, fissure 17 could have erupted 1924 magma (it takes about 100 years to turn picro-basalt into andesite through evolution), and 1974 and 2006 both fed generally towards the kamakaia hills area which is known to be a storage medium where very evolved magma has erupted before like at fissure 17. I don’t think that there is ~7 km3 of magma that never made it to the surface just to make pu’u o’o happen, maybe 1 km3 being very generous and including the entire uprift part of the ERZ. The hotspot bulge might compensate 2 km of the height, but the big island is not 9 km thick, it is 17 km thick, because the weight of the island pushes down the crust, it is thickest in the middle in just north of mauna loas caldera. Again this is relatively negligible in comparison, and just shows how the amount of magma erupted in the last 200,000 years is huge. The triangle isn’t a scale model it is more just to visualise what I’m talking about because I think I didn’t explain it very clearly. In both cases the sides are probably too steep to be good analogues for mauna loa anyway, even its submarine slopes are less than 40 degrees on average. I forgot to add, the so called bulge that the islands ride on doesn’t really exist under the big island. There is a feature called the Hawaiian arch, which is formed because the weight of the island is able to pull the crust down against the plume head. 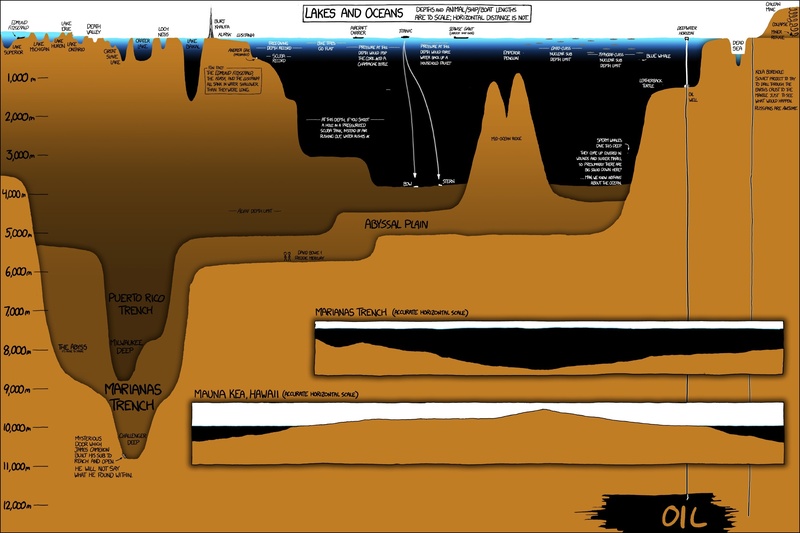 The ocean immediately around the big island is actually deeper than the surrounding abyssal plain. The islands do receive a buoyant force from the plume but it is completely countered by their mass. Most of the height loss that causes them to sink is from erosion, subsidence is slow and only really takes over when the seamounts get too far from the equator for atolls to be sustained. After a long and tedious task of tracing out the outline of the flow from an eruption map kml, finally I can make a comparison between the eruption in 1790 and the eruption this year. As can be seen, both are similar in size and area, but this years eruption was more concentrated on a single area while 1790 had a very extensive vent system. Both eruptions are significantly bigger than 1840, 1955 and 1960. I also made a map of the vent systems of those two eruptions. Red is 1790, red polygon is heiheiahulu. This shows well how 1790 had a way bigger vent network, probably the main reason why its volume was relatively less than 2018 and why it never built a cone. Thank You Turtle, very nice! I think everyone forgot there was another lava eruption equally as big as kilauea that has gone on unobserved in silence for the past 2 months. Nice one! And you’re right, I completely forgot about this one. Do we know if there is any publicly available monitoring equipment for Sierra Negra? My google skills have failed me miserably on this one. Also, do we know if there is a caldera collapse associated with this eruption? I dont think there is any actual collapse but I dont know, and sierra negra has a way bigger magma chamber than kilauea so it could take a lot to empty it. 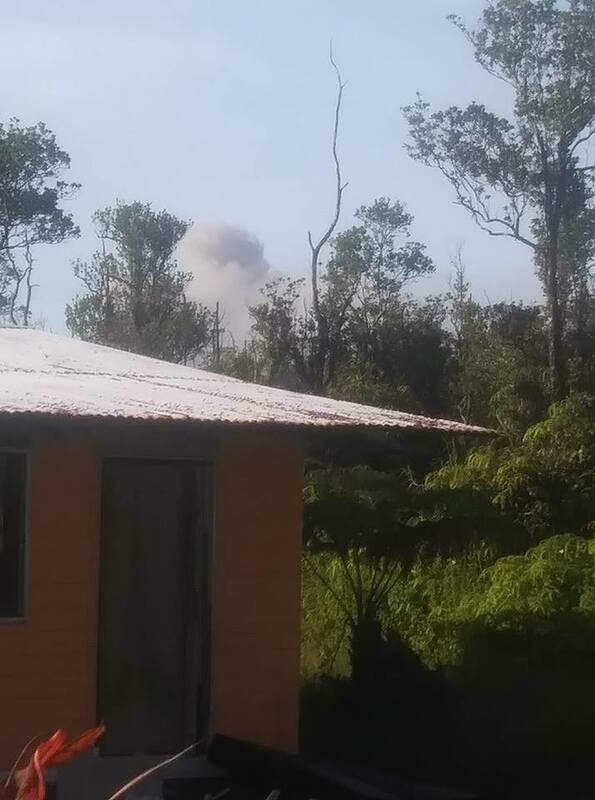 This eruption was basically a combination of kilaueas current eruption with mauna loas 1950 eruption, at least on the first day. I measured the height of the lava fountains against the height of the volcano and the entire line of vents (something like 5 km long) was exceeding the 100 meter mark, the one observed here when it first formed was over 500 meters high……..
Kuchinoerabujima has jumped from yellow to red alert. Update from usgs on eruption on Hawaii, new graphic. Bit of an instability on two separate seismographs. Surely that must be someone moving the instruments? It is a bit strange. It is seen on two different instruments, in different places. These are the only working GPSs which show timelines: the others only show daily averages (the plot of the south caldera one has a scaling issue and can’t be used). But the tilt meters show nada, in more or less the same place. It looks like a timing error on the GPS but I am unsure what would be the cause. Perhaps a lot of water on the instrument. It has completely recovered and has flatlined. My guess remains water on the receiver delaying the receipt of the GPS signal. In Iceland there is a lot of (tectonic – of course lol) movment: Torfajokull, Bárðarbunga,Hvannadalshnjúkur. Seems to me the activity increased also a little bit at Grímsfjall. The quake at Torfajökull is the largest since measurment began in that area. I find the uptick in activity around Grímsvötn interesting. I think it started at about the same time as the Skaftár cauldrons emptied, so it could be related. There is a small but notable increase of the gradient in the cumulative seismic moment graph. The Torfajökull quakes seem to line up with the Goðabunga intrusion, which has been described as a vertical sill. It kind of reminds me of the N-S faults of the nearby SISZ. Probably just a coincidence. It started before this event, activity all along the fissure swarm has been increasing recently and this extended activity isn’t included in the specific Grímsvötn area plot. The Skaftár cauldrons empty every few years so it’s hard to correlate this activity to the recent activity at Grímsvötn. We are seeing more deep quakes across a wide area now in various systems, whether this has contributed to an increase in heat flux to the Skaftár cauldrons is hard to tell. Regarding Torfajökull, there’s no evidence of any link between Goðabunga and yesterday’s activity so it looks purely coincidence that the quakes line up in that direction. The area of quakes at Torfajökull is more likely connected to Bardarbunga fissure swarm and an extension of the veiðivötn fissure, but this based purely on extrapolating the fissure line so take it with a pinch of fermented shark. Of course, the activity could purely be Torfajökull’s. Carl’s looked at the signal from the quakes and it’s a bit mixed; could be a combination of tectonic and magmatic signatures. They would, but again I’d put my money on coincidence. The interaction between the large volcanic bodies and the rift zone creates all sorts of kinks and bends depending on the stress fields involved. Looking at the depth against bearing for the five quakes there isn’t a clear progression, they tend to jump back and forth on the bearing with height. Bottom line is there aren’t enough data points. The quakes yesterday started wit a blip, a strong quake, a weaker quake and a few aftershocks. That sounds more like tectonic. This is the peak melting season and perhaps this is affecting the stress field in various locations. As an Icelandophile who’s been (mainly) lurking on VC since the last activity in that wonderful country, allow me to pop into reality for a moment. I defer to the scientists on here (nice to wake up to the dulcet tones of Albert on the radio the other day) but I am not sure that melting is likely to have affected this area. Not enough ice: the glaciers are small, and these quakes are some distance from the rather petite Kaldaklofsjokull. There was a larger swarm (but none > 3) in June ’17 beneath Hattur, a few kms to the E, just N of Torfajokull. This swarm is beneath Austur-Reykjadalir which is a spectacular and little visited area of solfataras etc., including the loudest steam vent in Iceland, Hvinandi, so it’ll be interesting to see if these quakes have changed things at all. And another hurricane is following the path beaten by Hector. Will be interesting to see what the swell will do to the lava. More black sand, probably. Poihiki could find itself a long way from the water. I haven’t seen the actual spaghetti model for it yet, but based on this, the steering forces are not as defined as for the previous storm. The size of the track envelope indicates track uncertainty and not storm size. The earthquakes in Italy are intensifying. There was an M5.4 yesterday. The quakes are along the same fault that was a problem in the past few years, but further south. Various UK newspapers warn about its impact Vesuvius, revealing a slight lack of knowledge of geography as Vesuvius is on other side of Italy. Well, Albert, it has to be said that the press managed to locate Vesuvius within Italy. That’s not bad for them these days, when the concept of “press freedom” appears to mean “freedom from facts”. BTW, my comment was in regards to the manslaughter charges against scientists over an earthquake. The position of the scientists statements were in keeping with standard theory, yet leave it to a lawyer to try and find blame over something they had no control over. Point of fact, Italy is not immune to occasional quakes and quake swarms. In my opinion, just as much blame, if not more so, could be placed at the feet of the officials who failed to implement stricter building standards. The ultimate safe bet? The same as volcanoes. Don’t be there when it does its thing and you stand a pretty good chance of it not killing you. Getting hit by a distraught teenager is a different story. This is a picture of the big island as I think it might look in about 200,000 years. I drew it based on the comments above. Obviously it is hypothetical but there is a decent chance something like this will happen. At this point kilauea (red) is getting towards the end of its maximum growth stage, and has a much larger size, even slightly bigger in area than mauna loa now, but not as tall yet (that will probably happen as it starts to wane and more flows stop closer to the summit), currently it stands at 3.5 km tall. It has a large caldera, formed because of growth of a larger magma chamber associated with its massive magma supply rate, eruptions are almost continuous and at high rate, most often as extensive summit overflows from vents near the caldera, but sometimes as large fissure eruptions on its east rift. The southwest rift doesnt really exist anymore, the recent growth of loihi has largely removed the stress gradient in that direction so eruptions on that side are essentially radial. The magma supply rate is enormous, as high as 35 km3 of magma per century, or about 7 times higher than its historical average, resulting in eruptions on the km3 scale every 20 years or so, and ‘small’ flank eruptions every few months. Major explosive activity is now very rare, restricted to infrequent rapid ascent of gas rich magma that bypasses the main magma reservoir. It wouldn’t he inaccurate to consider kilauea to be a small flood basalt province at this point in its life. Loihi (yellow) is above sea level now and is at a similar stage in its life to kilauea during the pahala ash eruptions (20,000 years ago), its summit is about 800 m above sea level and it experiences violent eruptions often due to water interaction through a deep caldera. It is not connected to any other volcanoes because flows from kilauea have surrounded it. As of yet, loihi still has not quite managed to capture a significant amount of the hotspot, and it erupts about every 20 years. Mauna loa (orange) is in its post shield stage and erupts only about once ever 200-500 years or so, it is covered in cinder cones and there is abundant evolved magma in its summit area from its transition. Another mass landslide (alika 3?) has removed most of its southwest rift, and that combined with the rapid growth of kilauea and loihi in that direction has favored almost total abandoning of rift activity, with resulting radial eruptions building a circular profile. It is still roughly 4 km tall, though its average height is lower than now. Hualalai (light green) is relatively similar to now, but it erupts less often and is ringed by tall sea cliffs. It is arid on that side of the island so relatively little erosion has occurred despite its age. Mauna kea (green) is very eroded on its east side, with deep valleys cutting into its side. It is almost inactive, with eruptions being small and happening 10,000 years apart or so. Kohala (purple) is even more dead, with only one single eruption occurring between now and the time of this picture. I like how your speculative rift swarm/zone for Lohi continues the rotational rift zone orientation of Puna Ridge relative to the previous one. Yes, I would assume the rift zones are not static features and can move within the volcano depending on stress fields, sort if rotating around the main conduit which is more or less fixed. Currently loihi has basically north south rift orientation, but as it grows it will end up in contact with kilauea and that will cause it to adjust a bit. That is also why I think kilauea will become partly radial after this point, as it is going to be topographically prominent at this stage and it’s southwest rift will be landlocked, both of which will favor radial eruptions. It was unexpected when I realised a major collapse of mauna loa combined with rapid growth of kilauea would actually lead to a significant portion of mauna loa being buried, I would normally consider something on this scale to be impossible in such a short time frame but considering the big island as a whole is less than 1 million years old it is pretty reasonable. It is essentially a flood basalt that leaks instead of flooding (double the volume of the Columbia river basalt in the same time frame). I might have made loihi a bit big for the age it is supposed to be though, when kilauea was erupting the Pahala ash it was only 30,000 years since it breached sea level so it was probably a lot smaller than it is now. I also made the rift zones way wider than they probably would be in real life. Well, your effort is probably more rewarding that my last project. The bit IF on that one is if the author of the next article will find it useful or not. I ran across some intriguing stuff that I am ill-equipped to try and explain. (part of that whole “arguing with myself” thing I mentioned earlier.) It needs someone with a measured tone to do it justice, I would just sound like a ding-bat trying to explain it. The next article is on the future of hawaii? Ya see, the big deal is that I don’t even have confidence in my ability to write it. I know what the game plan is, but that’s about it. Sure, I can string a sentence together, but so can most people. This thing needs thought.